Mars gives particular results if it is in special houses in horoscope. It is called as Mangal dosh. Horoscope becomes manglik if Mars is in lagan, fourth, seventh, eighth and twelfth house. 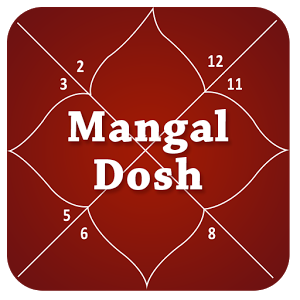 Usually Mangal dosh is considered as inauspicious. Mangal dosh is not inauspicious in every case. It also makes person adventurous and prosperous. A person gets good success in technical field. However, relations and nature becomes sensitive in Mangal dosh. Therefore, it is advisable to match the horoscope before getting married. On the above cases, you should chant Gayatri psalm every morning-evening. Prepare 15-16 ratti coral ring in copper and wear it in ring finger on Tuesday afternoon. One should match the horoscope before getting married. Carefully choose the wedding time. Take care of your health and nature. You should think before speak anything. One should take bath every morning. Regularly offer water to the Sun. Worship lord Hanuman in morning-evening. Wear pearl or opal by consulting an astrologer. Use more light yellow color.